The documentary not only discusses research results, but also shows the healing process of several people suffering from the previously mentioned diseases. For example one of them had already five bypass operations, another woman was diagnosed with breast cancer, a third woman survived two heart attacks and was predicted to live only another 6 months, and yet another group of patients were suffering from type 2 diabetes. After changing to a plant-based diet they not only could dismiss their daily medicine but are still alive today. In the documentary, several different studies are presented – all of them concluding that the excessive meat and dairy consumption is directly causing and spreading the aforementioned severe diseases, which by the way appeared only in the last 50-100 years in significant numbers. T. Colin Campbell was interviewed in the film about his China Study, in which he and his Chinese colleagues evaluated data about the diet and diseases of the Chinese population. The result of his several decade long work was the proof of a direct causal relationship between the consumption of animal products, and cancer, diabetes and cardiovascular disease. Caldwell B. Esselstyn came to a similar conclusion during his studies, which he published in his book Prevent and Reverse Heart Disease. He showed that a whole-foods, plant-based diet not only stops or even heals cancer, but also reverses the narrowing of the arteries. Several other doctors were interviewed in the documentary who also confirmed the positive, healing effects of the vegan diet. Although, the most convincing to me were the patients who were healed of their serious diseases only by changing their diet. Along with the documentary a book has also been published with the same content and messages as discussed in the film. Additionally in the book you can find tips for changing your diet to vegan. Also included in the book are more than 100 recipes helping to take the first steps into a meat and dairy free healthy future. One of the recipes was this homemade almond milk I originally found at Savory Simple along with the recommendation for this documentary. I used the almond milk both as garnish and as broth for the broccoli soup below. Cow milk is basically an emulsion of fat, protein and water. Nuts are rich in fat and protein, so any kind of nuts can be used to make a purely vegan milk. If you might wonder about the missing calcium – nuts contain about the same amount of calcium as milk, so there’s no need to worry. Similarly to my previous post, I created this vegan soup for a Hungarian vegetarian foodblog contest organized by a friend. I used the almond milk in a very simple dish, which basically contains only two ingredients: broccoli and almonds. If making soup, it’s always worth to set aside some blanched, still firm pieces as garnish. I reserved some nice florets and cubes from the stem of the broccoli, which I blanched only shortly to keep them al dente. Many people use only the florets of the broccoli, although the stem is edible too. I like to use the stem to cook a broccoli stock, which I use afterwards to cook the florets. For the cream soup you can also puree the softened stems and press it through a fine sieve to remove hard fibers. From the homemade almond milk I created small almond panna cotta cylinders using agar-agar. Because I don’t own any cylinder-shaped silicon molds, I jellied the almond milk in a plastic cup and used an apple core remover to cut out the long tubes. I pureed the remaining jelly and used it as garnish along with some reserved broccoli stem puree. The roasted almonds served both as crispy and a kind of “spicy” component. Actually, the dish can be served without the soup too. Put 100g almonds in a plastic box and cover with 2 cups of water (about 400ml). Soak overnight in the refrigerator. On the next morning, drain the water and add 2 cups fresh water (400ml). Blend to a fine puree and drip off the milk through a fine sieve lined with cheesecloth. Gently press out the liquid from the almonds. Use the remaining solids for another purpose. Season 200ml almond milk with salt and sugar and mix with 1 tsp agar-agar. Bring to a boil over low heat stirring constantly. Chill until not too hot and add to a plastic cup. Refrigerate until the milk becomes completely solid. Remove from the cup and using an apple core remover cut cylinders from the milk. Cut the cylinders in half and reserve. Puree the remaining jelly and reserve. Blanch 20g almonds, wash with cold water and snap off the skins. Separate each almond into two halves. Line a grid with parchment paper, add the almonds and roast in the oven at 200°C / 390 F until brown. Remove from the oven and reserve. Wash the broccoli and trim off the green florets. Reserve 10-12 nice florets. Cut the stem into 8mm cubes and reserve about 20-24 cubes. Blanch the cubes for 3 minutes and the florets for 1 minutes in salted water. Immediately chill in ice water, drain well and reserve. Dice all remaining pieces from the stem and cook with 500ml water and a pinch of salt for 20 minutes. Drain the cooking liquid and cook the florets in this flavorful broth until soft but still bright green. Meanwhile blend the drained stems into a fine puree and press through a fine sieve to remove fibers. Reserve 1-2 tbsp of the puree for plating. Remove the soup from the heat, add the rest of the puree and blend until creamy. If the soup is too thick, add some almond milk. Season with salt, chili oil and lemon juice. Optionally press the soup through a fine sieve to get a more smooth texture. 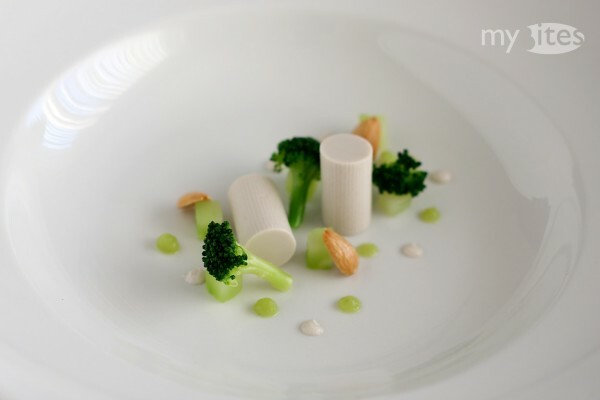 Warm the almond milk panna cotta and the reserved broccoli garnish in a 60°C / 140 F hot oven. Put 5-6 broccoli stem cubes on warm plates, add 2-3 florets, 1 halved almond milk panna cotta and 3-4 pieces of roasted almonds. 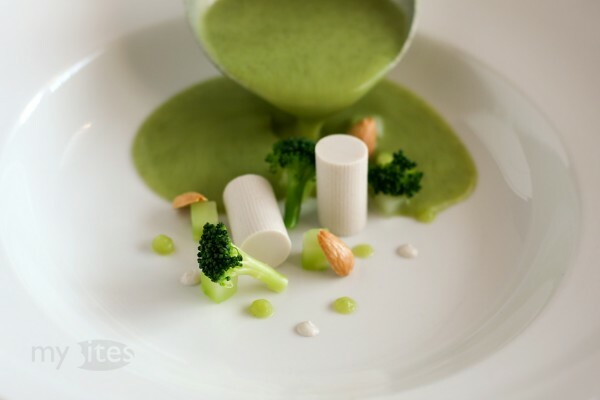 Add some drops from the reserved almond milk puree and broccoli puree. Pour or ladle the hot soup at the table. Wow, it’s not often I come across a truly original recipe, but this fits the bill. The almond panna cotta tubes are over the top! Congrats. Thank you, Cathy! The almond panna cotta is pretty straight forward if you already have the almond milk – you can prepare it using any other nut milk too. Nut milks are great to substitute cow milk, and in most cases they are much better ingredients. This is simply stunning and so original! I love the combination of flavors and textures it brings, brilliant! Thank you Gourmantine and erinwyso! Sometimes it’s pretty surprising how much you can make from very few ingredients only.